I know it's not Tuesday, but I wanted to share my latest Etsy Treasury dedicated to the hard working men and women of America. That includes all of us! And if you have any interest in the history of Labor Day, click on the photo below to read an article published by the History Channel. The article on the History Channel site was very interesting. Oh! Thank you so much! What a delightful blog! I especially love the post about the staircases. It's so great to really pay attention to what Labor Day means...most people forget that it's more than just a day off! Labor history is a deep passion of mine....Thanks for featuring my work boots....I hope folks will remember workers do the real work and take all the risks in society, and need to be paid fairly. I always have to remind people that many died so we could enjoy worker protections, vacation time and sensible work hours...all brought to you by Labor Unions! 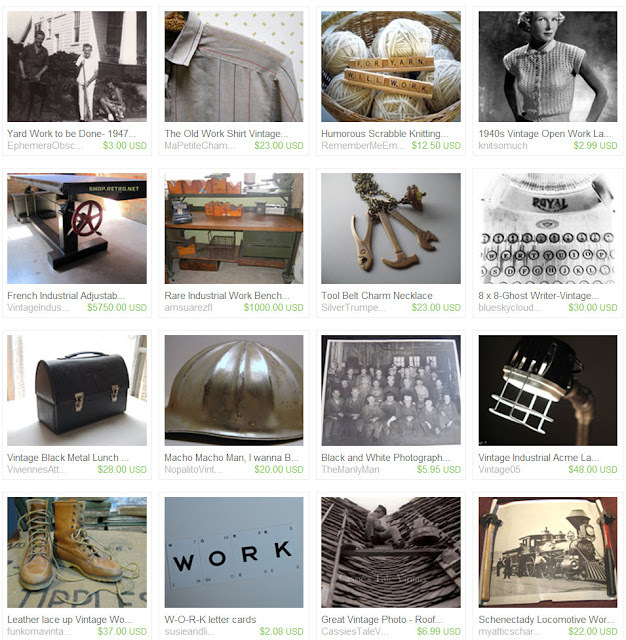 Thank you so much for including our work bench in your awesome treasury! !